Without a doubt, the summer has ended and fall is here. Just like spring, it came a bit early, and the magic is already happening. The leaves have been falling, and some of the trees are very close to bare. The beauty of it is, that I can now discover some of the nests that were used over the summer, and how wonderful it is. Is anyone else already experiencing the effects of fall? A little rain has fallen over Boomer Lake, and it is nice to be able to stalk birds again without the hard crunch of grass underfoot. The blades are still brown, but the moisture has softened things up a little. 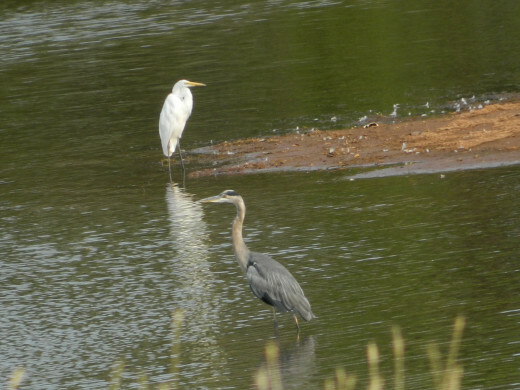 This morning, there was a group of four Great Egrets in the same area, but I was unable to capture all four together, due to their distances apart. The Canada Geese have regained all their flight feathers and are happily enjoying themselves in the skies again. Training has begun for the young ones, and it is nice to see entire families and flocks out there again after that long eclipse period when the eggs have hatched. Too Late,You Missed the WFF Bout! 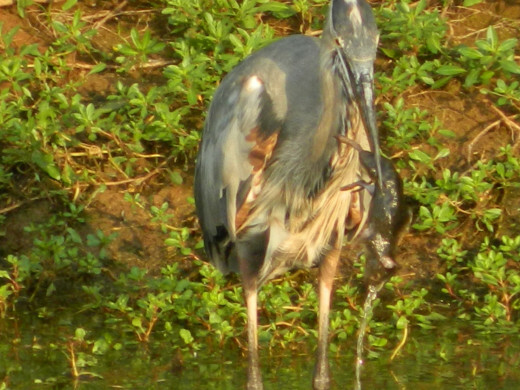 Great Blue Heron was in the small sheltered area of the southern part of the lake that is on its way to becoming dry. 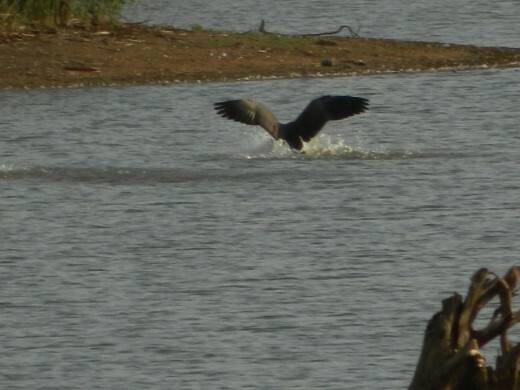 He was doing his best to find fish and small crustaceans in the water, and then I saw him staring up on land. I didn’t have to wait long to see what he had spied, and here it is, this good-sized mouse. It took him a good seven minutes to try to eat it, and believe me, the entire event was a lengthy process. I left him in good spirits, and I’m sure that he gave himself a nice rest after that huge meal. The Yellow Warbler was surprisingly out in the open for me to get a few nice pictures. 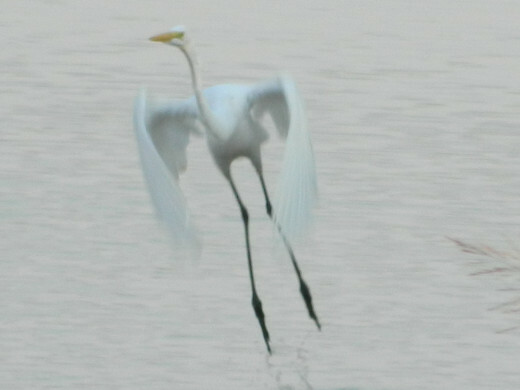 Even on an overcast Saturday, the bird was very bright in the camera’s light sensor. I had to tone the color down a bit in order to dispense with the glare. This is such a handsome bird, located in the former Eastern Kingbird nesting tree. This is a tree right next to the water, which happens to be a general hub of activity, where one of the Great Egrets also happens to be hanging around. 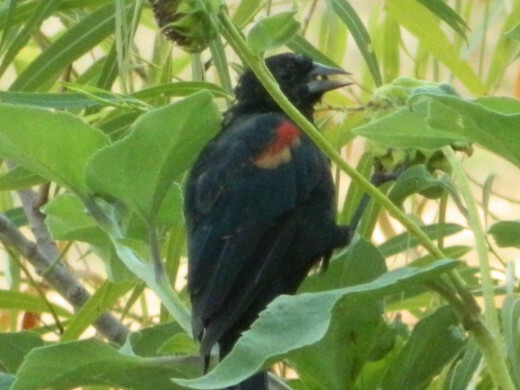 Here’s a Red-Winged Blackbird eating the sunflower seeds from one of the wild sunflowers around the lake. These are on short stalks(five feet or less) and don’t last any more than around ten days. They seem to provide excellent sustenance for the birds, even before they dry out. 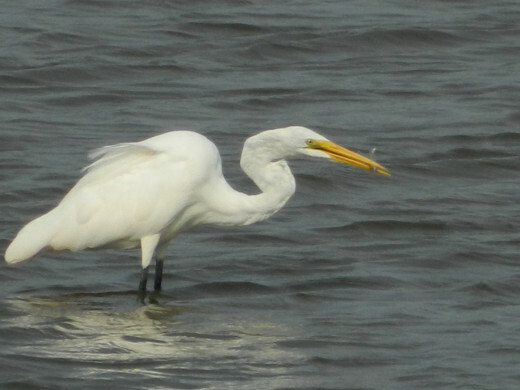 The Northern Reaches has been hosting a couple of Great Egrets, as well as a couple of groups of Mallards. I think I’m the only one that travels out this far, and since the water has receded, it is fairly good walking along the shore. 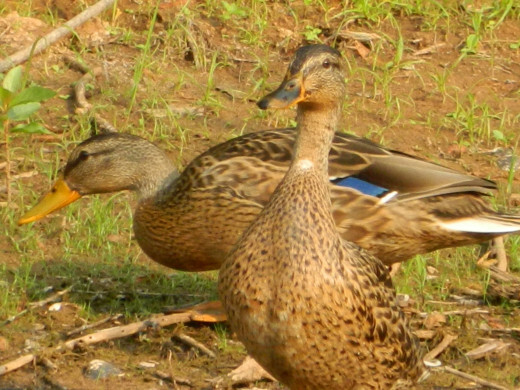 This is where I got the photo of these two. The week has ended, and I hope to see birds making their way south next week. In the meantime, keep your eyes to the ground and your head in the clouds. Happy birding! Thanks, Lightshare! I appreciate that. Sorry that I never answered your comment, it was buried in spam, and I never knew that existed until a few minutes ago. Thanks, gamby. I just thank my lucky stars that I happen to be in the right place at the right time so much. LOVE LOVE LOVE all your articles!!! The pics, as always, are amazing. 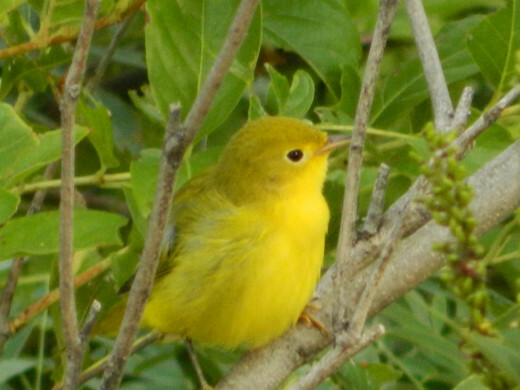 The little yellow warbler is beautiful! You have some awesome shots. 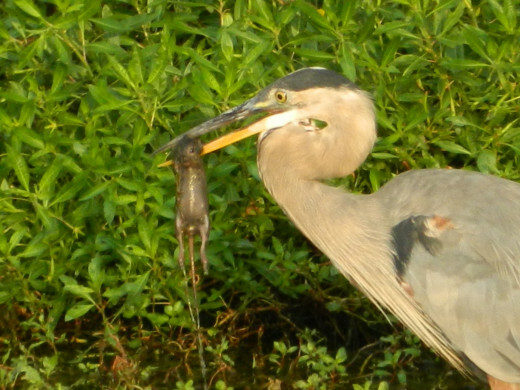 Besides the one of the heron with the mouse, I especially like the last pic of the goose and egret. 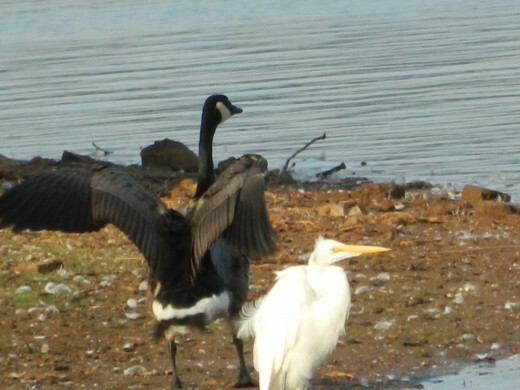 Can't help but chuckle every time I see the egret's plumage being blown by the wind. Rated all up! Hummer moths are characters, Jackie. 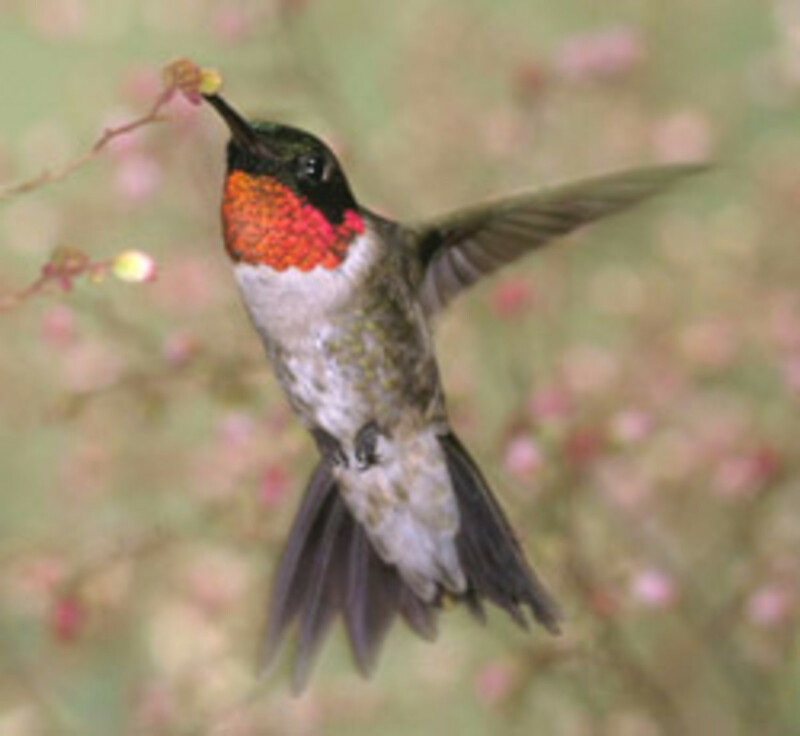 I recall seeing a battle between a hummer and the moth while I was home in ME. That moth even won the battle. It has cooled down considerably, and the trees are losing their leaves. Some of the birds, like the flycatcher, are already gone. Thanks, sallieann, you are too kind. I don't think my photos are that good YET, but I'm working on it. I will be waiting to hear about your trip via a hub, Johan. Thanks, whonunuwho. Where were you in OK? I just saw some leaves fall a few days ago and I am not ready, no, this summer has been so short! Hope to go out for some shots tomorrow if it doesn't rain again! Managed a few flowers and another hummingbird moth (immobile) today outside my house in my garden. Makes three of those I have seen this year and to have never known about them til a couple months ago that is strange. Beautiful pictures you got. Especially loved the first shot and then the little warbler. Stunning photos as always! Sure seems early for Fall. I really don't see any sign of it here, though we are farther North. I guess that drought might make a difference for you. Up & Awesome. You take the most amazing photos! Have you ever thought of putting them into a book? Another great visit to the lake. We are off to see the Namaqualand Wild Flowers and will do some serious birding on the West Coast from Tuesday. 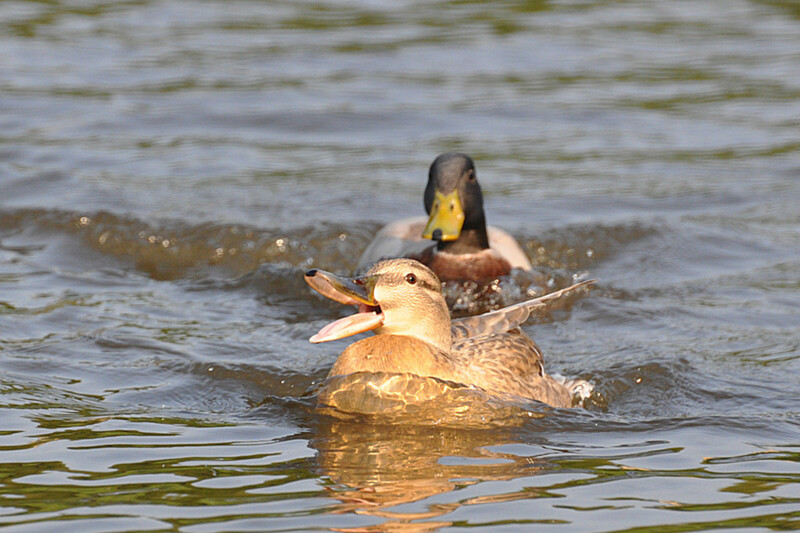 Beautiful photos.aviannovice, one of my favorite subjects, the wild birds and love to share your words and pictures. 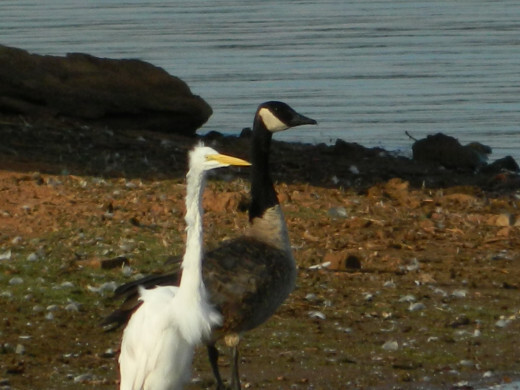 Out in Oklahoma, the dry spell has got all the birds out along the shore lines of the lakes. I was out there today and saw a great many species after water and minnows. A most enjoyable experience. Nice hub. Oh, it's just so much fun, Jeannie!